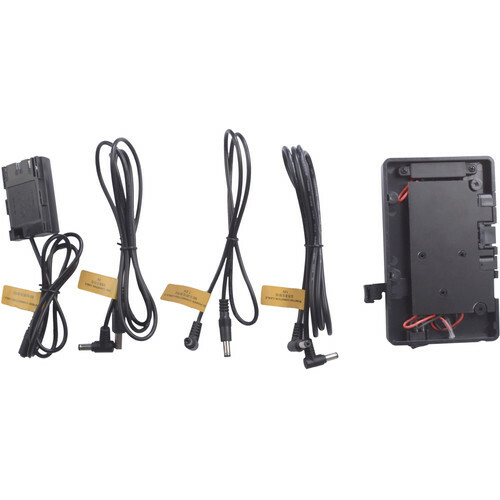 The DigitalFoto V-Mount Power Plate with USB, 7.2V, 12V, and D-Tap Output provides four output ports from your V-mount battery for commonly used accessories. The plate features power-regulated USB 5V, 7.2V, and 12V outputs. An unregulated D-Tap port also provides power from the battery. An integrated on/off switch turns off the power from the battery to the accessory ports. Four included cables help you power your accessories. Integrated on/off switch prevents the battery from draining when accessories are connected but not in use. Box Dimensions (LxWxH) 10.2 x 9.0 x 3.2"